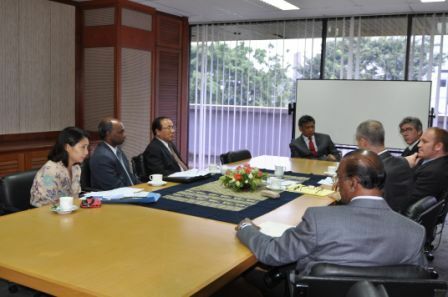 Rimta Silangit, Ravi Corea and Le Vu with ASEAN Secretary General Dr. Surin Pitsuwan, Mr.Rajaretnam (Special Adviser) and the World Bank team led by Phil Karp, at the ASEAN secretariat headquarters in Jakarta. 5 June 2009. The discussions were part of a week-long mission to develop a proposal for the ASEAN Sectretariat to implement a modern Internet based communications platform for outreach and knowledge exchange throughout the ASEAN Community. ASEAN has committed formally to a new phase of engagement with its community through its “Roadmap for an ASEAN Community 2009-2015”. The Secretary General, Dr Surin Pitsuwan, is tasked with implementing it and is also a strong believer in community outreach. He had also experienced first hand the power of interactive video-conferencing and multi-media communications through the ASEAN Secretariat's work with the GDLN – the global learning network founded by the World Bank and operated by a number of partners and saw its potential as a tool in achieving the vision of an ASEAN Community. The World Bank was asked to advise on the equipment, training, management structure and business model that would be required in order for the ASEAN Secretariat to develop a high quality, Internet based Video Conferencing and multi-media facility within its offices. The World Bank agreed to support ASEAN's request and sent a team to Jakarta to determine options and costs. Le Vu was recruited by the World Bank to advise on all technical issues. Le had previously assisted ASEAN hold post summit meeting briefings using IP technology which demonstrated “proof of concept” on the communication power of the Internet. At the same time ASEAN contracted Link Asea and nominated Ravi Corea to work as the ASEAN nominee with the World Bank team. Ravi was asked to prepare the mission's final report including a detailed business plan for the proposed facility which will become a tool for outreach throughout the ASEAN Community as well as a platform for greatly enhanced communications within ASEAN's core business processes.